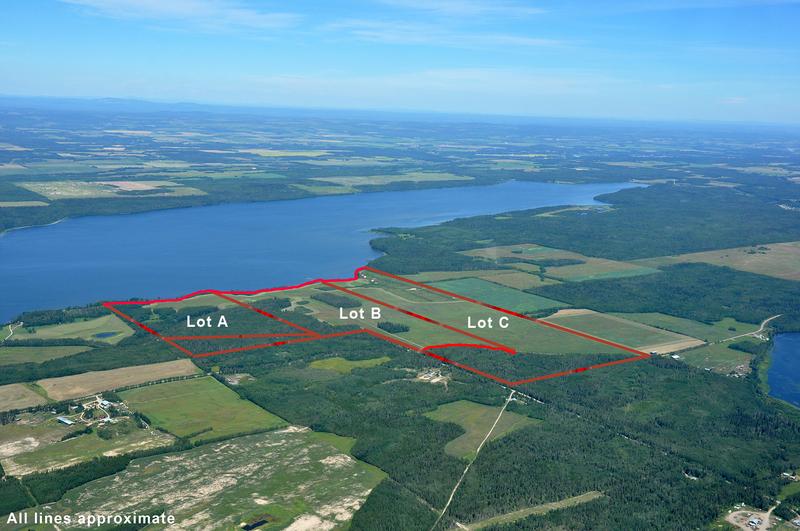 Tachick Lake Estates, Lot C - Welcome to NIHO Land & Cattle Company Ltd. Perfect spot for your hobby farm! 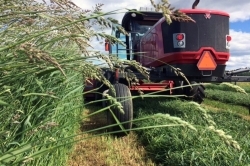 The majority of this lakefront acreage with 1,776 ft. of frontage is cleared and in crop production. 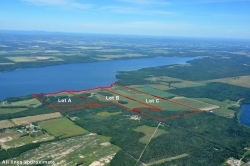 Build your dream home just a few hundred feet from Tachick Lake. Vanderhoof is only 15 minutes away on good gravel and paved roads. 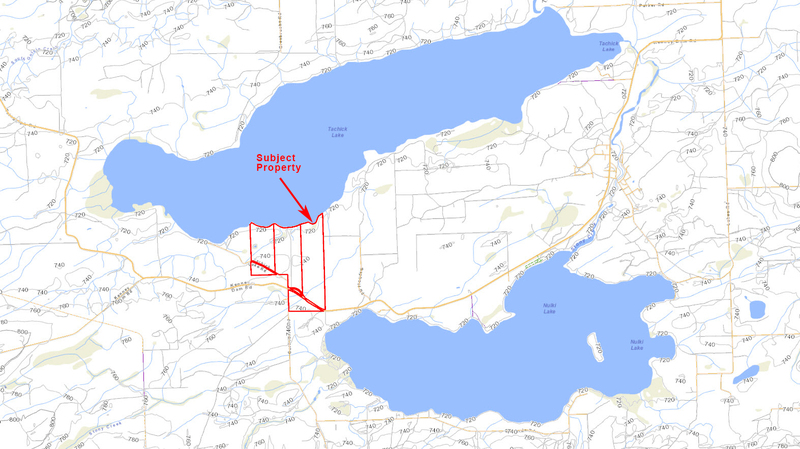 These parcels are available separately, or all three properties can be purchased together for $1,300,000. 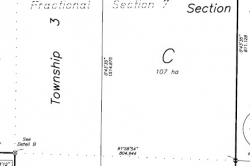 Lot: C; Pl: EPP43920; LD: Coast Range 4 (13); Section: 6; Town: 3; Range: 4; Narrative: & SECTION 7. 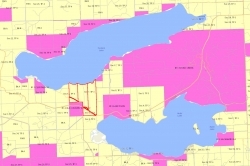 Tachick Lake Estates are beautiful lakefront acreages located on pristine Tachick Lake. 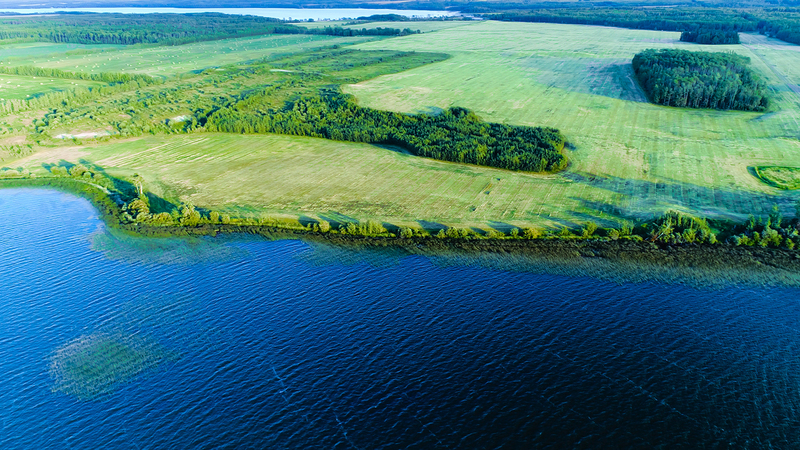 These three acreages are located on a fisherman’s paradise in the middle of some of the best farming and ranching country in British Columbia. Unlimited recreational opportunities await you in our favorite recreational retreats on Tachick and Nulki Lake, well known for their rainbow trout. 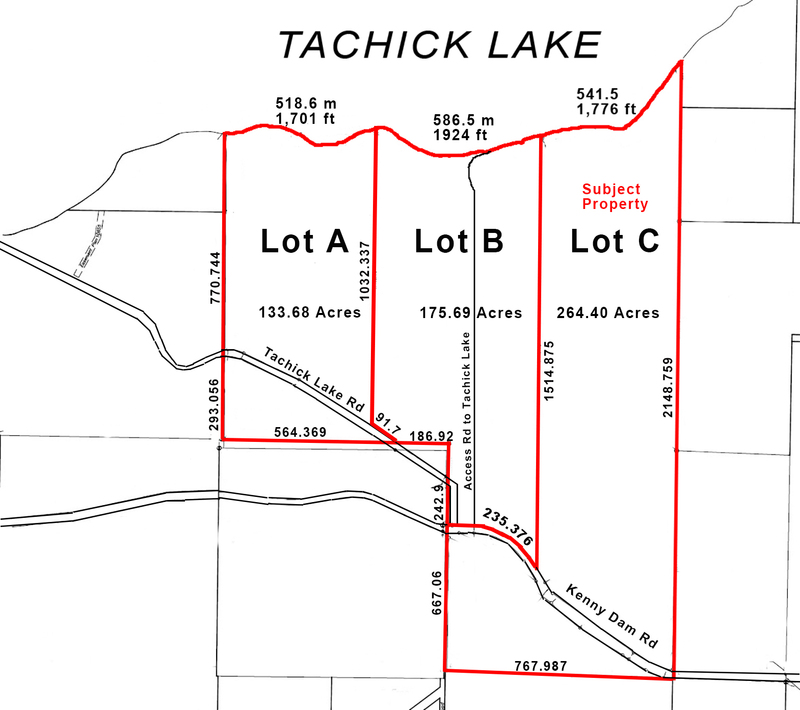 Located in Central British Columbia, off Kenny Dam and Tachick Lake Roads, Tachick Lake is a very private lake, with only a few others owning property on the lake. 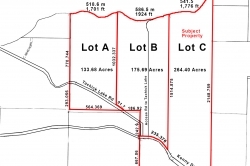 However, all amenities are located in the community of Vanderhoof, located only a 15 minute drive on 10 miles of paved and 1 mile of gravel roads. 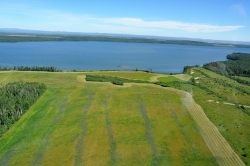 Generally, the property is flat and level on top and slopes gently down to the lake. The lakeshore consists of small pebble beaches with some larger boulders in some areas. 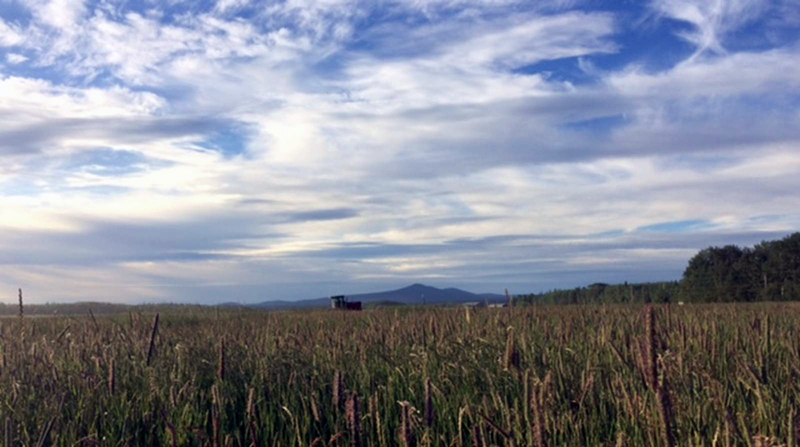 Approximately 358 acres in total has been cultivated into new fields and has produced crops of alfalfa and hay. Most of the remaining property is cleared and these fields are used for grazing. In the fall the fields are covered in geese and ducks during the migration south. 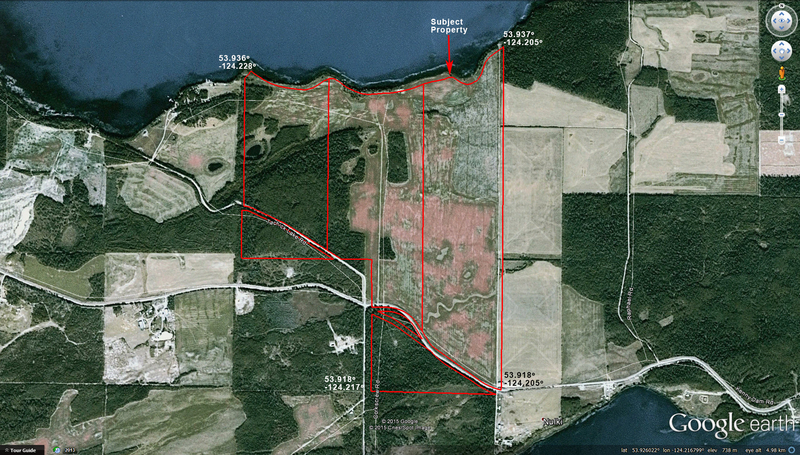 Lot C (1,776 ft (541.5 m) of lake frontage, 225 acres cleared). An excellent site to start your small ranch! The majority of this lot is cleared and in crop production. There is a good location for a home a few hundred yards from the lake which would offer a great view. 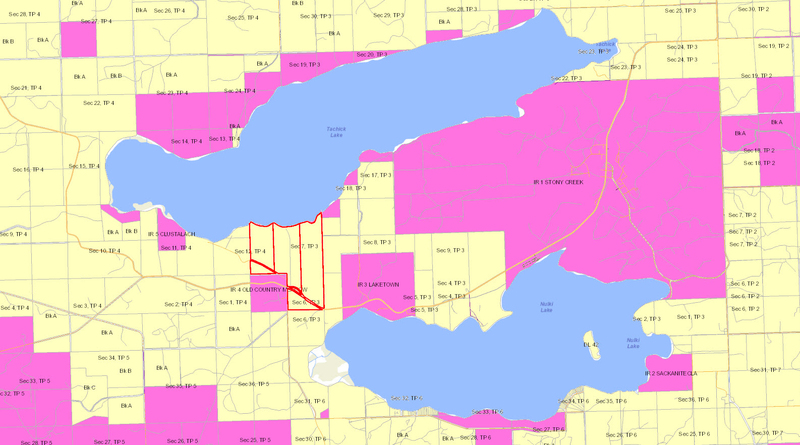 A small portion of this property is located on south side of Kenny Dam Road. While this portion is treed in poplar and scattered spruce, this could be easily cleared to increase your future production. Access to power is available along Kenny Dam Road. 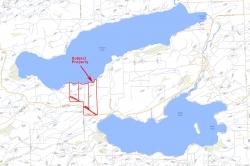 The property is located approximately 16 km (10 miles) south west of Vanderhoof in central British Columbia. Vanderhoof is the geographical centre of British Columbia and 100 km west of Prince George. 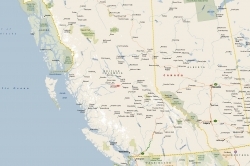 Vanderhoof is 98 km (60 miles) west of Prince George, which is 786 km (490 miles) north of Vancouver. From Highway 16 at Vanderhoof turn due south on the paved Kenny Dam Road at the sign that reads Nulki Lake, Tachick Lake and Kenny Dam Road. At 16 km (10 miles) the pavement ends and this is the east boundary of the Nulki Lake Ranch. 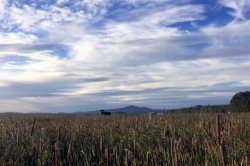 The Nulki Lake Ranch is on both sides of the main road for 1-½ miles (2.4 km). This main road is well maintained throughout the year. Lot C: From the end of the pavement, continue on the gravel Kenny Dam Road for approximately 2.21 km. You will be at the south east corner of the property. 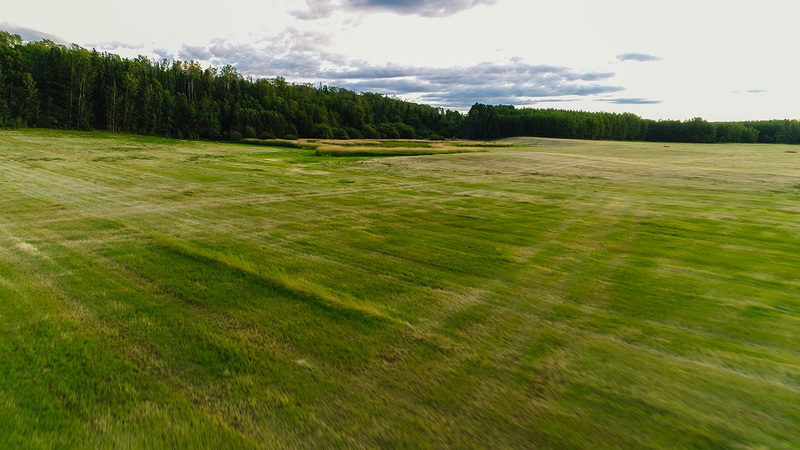 The nearby Vanderhoof Airport (CAU4)has an asphalt runway, runway lighting, GPS, an automated weather station, and an aircraft tracking system, and can accommodate most planes with an airstrip length of 1,530m (5,019 ft). Prince George Airport is the regional airport for Northern B.C., and is expected to play a key role in the economic development of the area. The airport has undergone a major expansion, renovating its runways and international cargo plane fuelling capacity. The airport can accept 747 airplane landings, and has an International Customs and Canada Border Service area for international charter flights. This area is popular with local residents and tourists alike, due to the rare combination of natural, unspoiled beauty and the many and varied year round recreational activities available. The fishing and hunting resources attract sportsmen from all over North America. Within a 60 mile radius of Vanderhoof, there are numerous lakes and rivers and many of these lakes offer rainbow trout fishing where you can catch your limit within less than an hour by fly fishing or casting. Moose and deer are very prevalent throughout this area. Activities vary from hiking, camping, boating, canoeing, golfing, horseback riding and water-skiing in the summer to cross country skiing, curling, skating and snowmobiling in the winter. 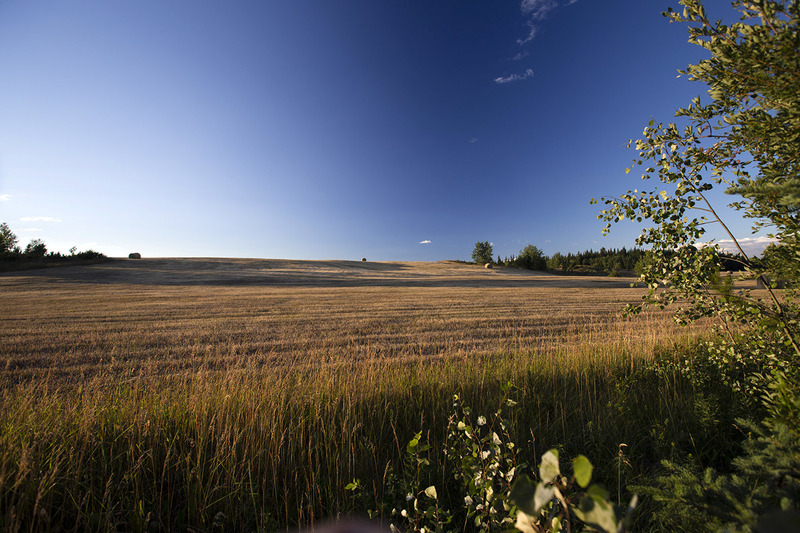 The town of Vanderhoof is known for hosting major year round events, such as Wild West Week, the Hootersville Hoot, Vanderhoof Airshow, Nechako Valley Exhibition, and Slow-Pitch Tournaments. Hockey, curling, figure skating, and ringette competitions and tournaments are held all winter. Community badminton, volleyball, basketball and indoor soccer take place throughout the winter season. 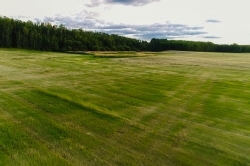 For those looking to hit the links, the Omineca Holf Course is an 18 hole course open from April to October. Murray Ridge Ski Hill is located 60 km away and Vanderhoof residents can enjoy downhill skiing throughout the winter. The Migratory Bird Sanctuary at Riverside park in Vanderhoof, is one of the major migratory stops for Canada Geese, Trumpeter Swans, Northern Pintails, Caspian Turns and White Pelicans – a must see for watchers and photographers, especially in the spring and fall. Burns Lake located 129 km (81 miles) west of Vanderhoof is an access point to Tweedsmuir Provincial Park, second largest Provincial Park in the province and one of the largest in North America. It boasts the 4th highest waterfall in Canada, Hunlen Falls. Caribou, moose, grizzly and black bear, mountain goats, mule deer are residents of the park. Boating, fishing, hiking, horseback riding, photography and camping are some of the recreational uses of this park. 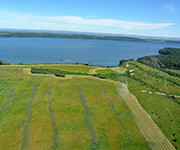 Access to the park is by light aircraft or via the Ootsa-Whitesail Lakes Reservoir. Boat launching access available at Wistaria on Ootsa Lake and Andrews Bay, also on Ootsa Lake, about 30 km west of Wisteria. Nulki Lake is 8 km (5 miles) long (4,093 acres) and Tachick Lake is 13 km (8 miles) long (5,439 acres). Both are renowned for their excellent fishing and many fishing derbies are held on these lakes. Trout up to 4 lbs. have been caught in Nulki Lake and up to 7 lbs. in Tachick Lake, both in summer and in winter (ice fishing). 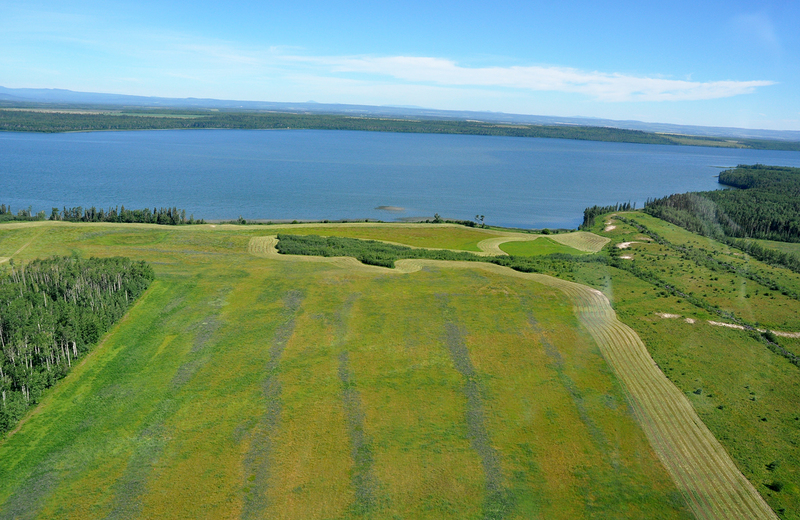 The Nulki/Tachick Lakes have been for many years recognized as one of the most productive small recreational fisheries in the Vanderhoof area. In the past 15 years a number of projects, generally funded under the Habitat Conservation Fund, have sought to maintain and enhance natural rainbow trout production and recruitment into Nulki Lake. One of the truly unique aspects of the fisheries resource associated with the Nulki/Tachick watershed is the presence of a falls on the lower portion of Corkscrew Creek. These falls are readily passable by rainbow trout, but not coarse fish. As a result the portions of Corkscrew Creek upstream of the falls are occupied exclusively by rainbow trout. Ootsa Lake, approximately 72 km (45 miles) south of Nulki Ranch is part of the Nechako Reservoir and northern boundary of Tweedsmuir Provincial Park. It is a beautiful, large lake, which offers some of the best boating in the province of British Columbia. 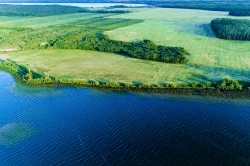 This huge reservoir links together many lakes including Tahtsa, Whitesail and Natalkuz. These waters can yield spectacular results for large Rainbow and giant Lake Char. Stuart Lake, is the seventh largest in the province (more than 90 kilometers long and up to 13 kilometers wide). It is a favourite fishing lake, not only for the locals but for fisherman from all over British Columbia, Alberta and the United States who come to travel the Stuart / Trembleur / Takla Lake system. 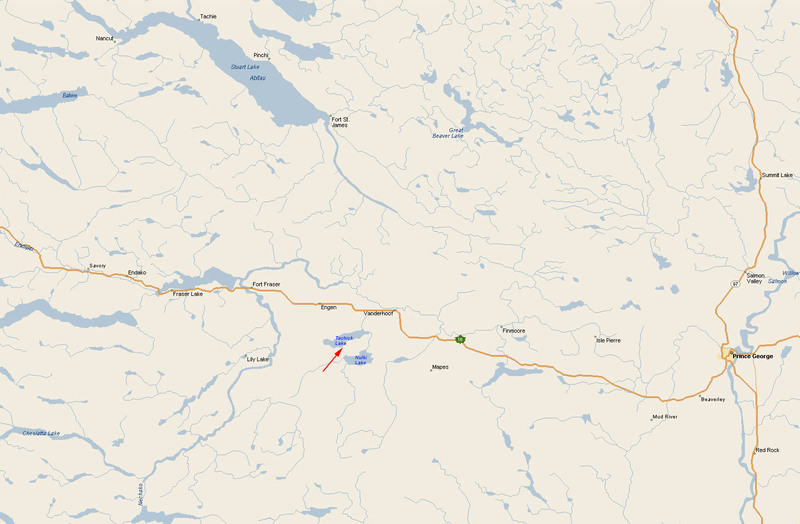 Stuart Lake is accessed from the town of Fort St. James 62 km (39 miles) north of Vanderhoof. The Stuart/Trembleur/Takla chain of lakes is one of the most beautiful and exciting in British Columbia. Stuart Lake has many large, beautiful, sandy beaches along its expansive shoreline. It is both a summer and winter recreational area, with a large number of cabins scattered around the lake, mainly at the southeast end at Sowchea Bay. Sowchea Bay and Colony Point have a large number of recreational residences and a few resorts, and many beaches. A person can travel up the Tachie to Trembleur Lake, up the Middle River to Takla Lake, to the Driftwood River, an unspoiled waterway of some 175 miles (281 kilometers). Lake trout to 9.3 lbs., rainbow trout to 5 lbs. and kokanee averaging 1.1 lbs. are resident in Stuart Lake. Access to power is available along Kenny Dam Road. Vanderhoof (pop. 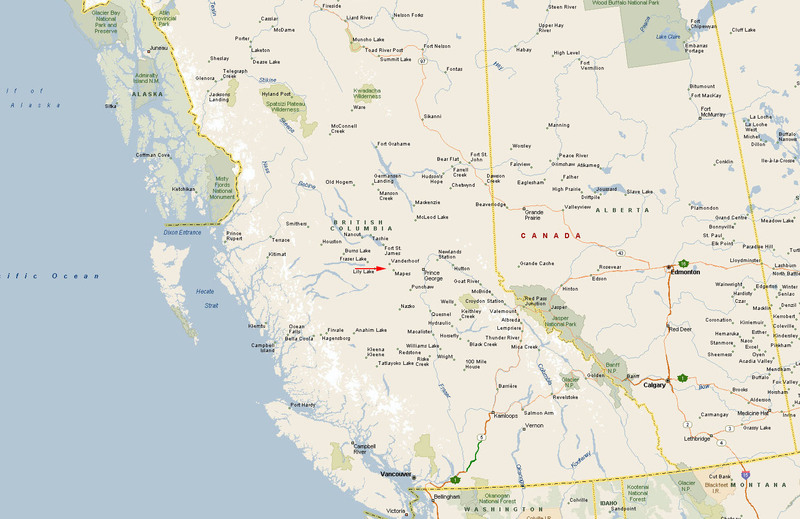 4,480) is a historic ranching and farming community, and is located at the junction of Highway #16 and Highway #27 at the geographical center of British Columbia. Forestry is the number one industry, followed by ranching and farming. 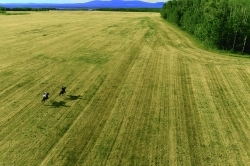 Vanderhoof is in a rich, fertile valley known for its cattle ranches and dairy farms with agriculture as the second largest industry in the region. There is also a growing industry in horticultural production. Mining is growing in importance, with a number of mines being developed in the area. Vanderhoof is a main service centre with several government offices, RCMP detachment, schools, hospital, medical clinic, shopping centre, 18 restaurants, 5 hotels/motel, theatre, bowling alley and golf course. The area is served by rail and air (land and float planes). The Vanderhoof Airport has an asphalt runway, runway lighting, GPS, an automated weather station, and an aircraft tracking system, and can accommodate most planes. The Nechako river, which joins the Fraser river at Prince George, runs along the north edge of Vanderhoof. There are a number of very nice residences along the river whose owners have both boats and floatplanes. From this river, you can go on waterways for over 200 kilometers, up rivers and lakes. 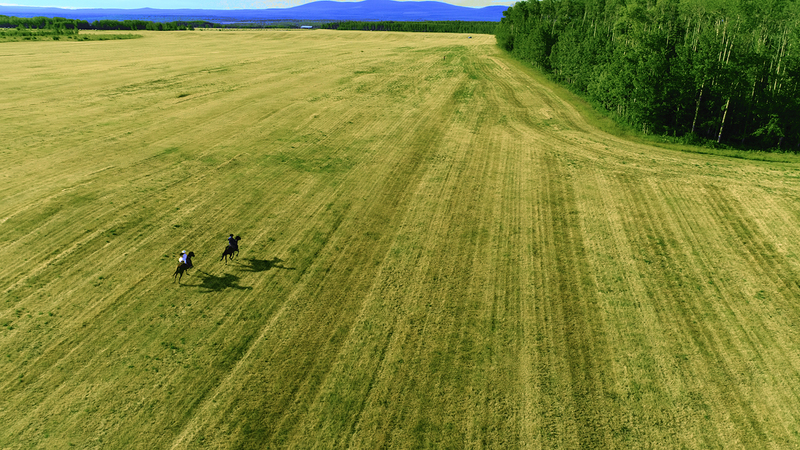 The people of Vanderhoof are low keyed, easygoing people who are mostly hobby farmers with horses and enjoy the outdoors fishing and hunting. Click here for the Vanderhoof Chamber of Commerce’s extensive brochure about Vanderhoof and the surrounding area. Simon Fraser’s diary relates that he was the first white man to trade with the surrounding First Nations people of Chinlac in the Vanderhoof region. After the fur traders came the packers, miners, telegraph operators, surveyors and finally, settlers looking for their free land of the frontier. Early settlers came in from the south, over the western end of the Telegraph Trail. They traveled up the west coast to Prince Rupert where they boarded river steamers to take them to Hazleton; then they trekked along the Trail to Fort Fraser. 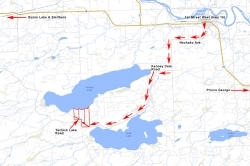 Those bound for Fort St. James branched off and followed the pack trail between the two Hudson’s Bay Forts; other continued along the focal point of the Nechako Valley. The telegraph line was erected in the early days with the object of forming an overland connection between America and Europe. The Telegraph Trail followed the line from one end of British Columbia to the other and since it was the only trail into the country, it was also the main artery of travel. Many of the men who had been employed on the telegraph line remained in the north, trading, trapping and prospecting for gold. 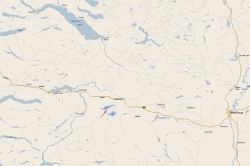 In 1906, the Village of Vanderhoof was only a survey line in the wilderness to mark the location of the planned railway. When the last spike was driven on April 7, 1914, it started a race for the land. 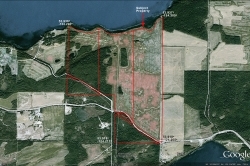 The Grand Trunk Pacific Development Company offered cheap land and had one of their employees, Mr. Herbert Vanderhoof, lay out the townsite. Vanderhoof is Dutch for “of the farm” which was very appropriate, since it was the first agricultural settlement in the province. The town grew, and in 1926, the Village of Vanderhoof was born. With the arrival of World War II, many young men left, and Vanderhoof came to a standstill. But, with the rise of lumber prices, and the arrival of new people in the late 1940’s, it started to grow again. 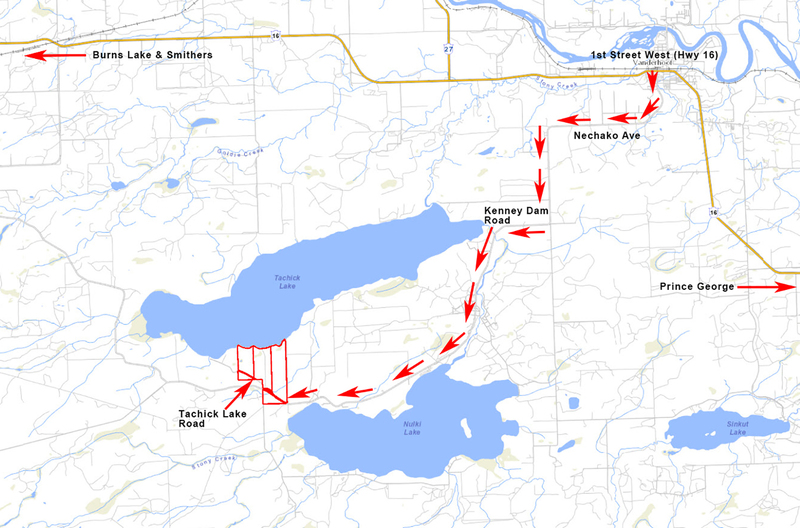 The next boost to the population and the economy came with the construction of Kenny Dam in the early 1950’s. At the peak of its construction it employed 1,500 men, and a number of them stayed in the area after the dam was built. The next expansion period came with a large influx of American immigrants in the 1960’s, and since that time Vanderhoof has enjoyed steady growth. 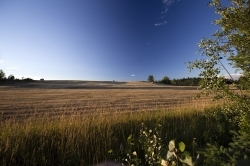 This region is well known for farming and ranching. 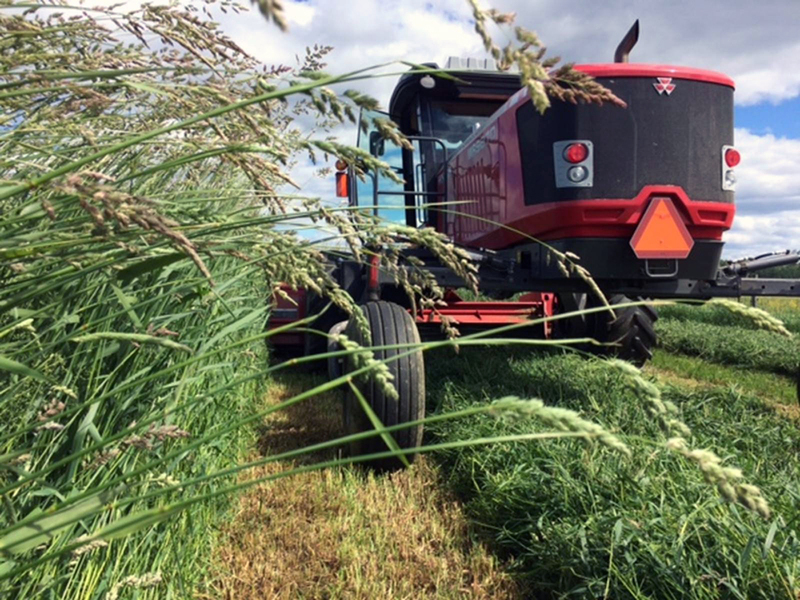 Portions of the property have been cleared for hay and alfalfa crops, and they are currently in production and producing revenue. Further information can be provided upon request.